Among the early steamship disasters along the American coast was the City of Philadelphia, a vessel that was driven at full speed into a large boulder just off the coast of Newfoundland, at Cape Race, on September 24, 1854. 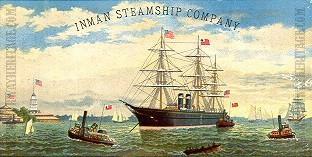 This iron-hulled steamship was a new addition to the Liverpool and Philadelphia Steamship Company, later to be known as the Inman Line. Launched in Glasgow, Scotland that May, the City of Philadelphia was making her maiden voyage with some 600 passengers aboard at the time of the loss. She measured 294-feet in length. A written account of the wreck by one of the passengers, J. W. Gadsby, has provided a historical record of just what happened and even offers a possible cause of the crash. In spite of his concerns, the captain, who is not named in Gadsby’s account, apparently did not worry about obstructions and kept his ship moving at 12 knots an hour, which was probably its top speed. Even when the ship came into bad weather with rain, the dark of night and poor visibility, shortly before midnight on September 24, a full 25 days after leaving England, the streamer was maintaining a full 10 knots when it struck the rock. While he expressed concern over the accuracy of his compasses, and obviously got too far north off his intended course, the captain appears to have been remiss in not checking his speed when approaching the coast, or taking soundings to determine his position from shore. Thus a fine new steamship was lost on its first voyage. The officers reversed engines, backed off the rock, took soundings and found that the ship was back in deep water once more. The ship struck the rock on the port side near the cutwater. The crew apparently recognized the area and knew the ship was off Cape Race. They turned for Chance Cove, a safe haven about seven and a half miles north. In the meantime, workers were sent below with oakum and blankets to plug the hole and keep the ship afloat as long as possible. Fortunately, the sea was calm that night, although Gadsby said there was a fog so thick that anything a ship’s length away could not be seen. Gadsby said the hold was six feet long and four feet deep and the water “poured in a cataract, soon filling the forward compartment of the hold to the water line.” By the time the ship reached the shallow water of the cove, the second compartment was flooded and the fires were extinguished. The steamer was run aground, about three quarters of a mile from shore and the anchors dropped. This was not necessary because this is where the ship settled, never to move again. The boats were run out and all of the passengers were put ashore, even with their luggage, by 5 a.m. There were no injuries. The problem was that there was no shelter. The nearest town was located about 60 miles away so the crew rigged up spars and sails to make tents, started fires, and food was cooked. Even mattresses and bedding was successfully brought ashore to accommodate the passengers. The next day the fishing boats discovered the stranded wreck and soon the cove was filled with small vessels. Many came to scavenge the wreck, while others offered the passengers a ride to civilization. Gadsby said the mail steamer Victoria hove in sight and agreed to carry the passengers to St. Johns, New Brunswick, at a cost of five dollars a head. The vessel got the job done in about two trips.